Pumpkin goodness, caramelized in a slow cooker and smooth like butter. Pumpkin Spice season is well underway and we still have a two months of it and I love it. Every time I go to the store I find isles of pumpkin spice everything like coffee, cookies, yoghurt, ice cream, coffee creamer, even gum. But I haven't seen Pumpkin Butter, I only seen it at a country store. If you live in the south you may know what I'm talking about. I'm going use this Pumpkin Butter for many recipes in the up coming months, so keep an eye out for them. Note: This is a doubled recipes, can be halved easily. 1.) Line your slower cooking with liners and turn it on low. 2.) Combine all ingredients together and stir. Cover it. Stir occasional, almost every hour. 3.) Once the pumpkin butter has cooked for 6 hours, turn off the heat and let cool. It will thicken as it cools. 4. )Transfer to an airtight container. Store in a cool place or the fridge. Stays fresh for up to 6 months. The first time I had pumpkin butter was at a farm in North Carolina. I had never heard of it, so I gave it a try. I was blown away! Pumpkin pie is my favorite and this is like spreadable pumpkin pie you can eat any time! YUM! Looks like a delicious idea for other pumpkin desserts. Can't wait to see what you make in the coming months. This looks incredible! I bet it tastes good on just about everything! I feel like I can't go anywhere without bumping into something pumpkin flavoured at the moment! However, I love that flavour - so autumnal! Especially with cinnamon. Thanks for sharing. That looks delicious! ! I will add it to my list of recipes to make this fall! Thanks! Oh my, this sounds delicious! I am a huge apple butter fan, but have never tried pumpkin butter. Definitely giving this a try. Thanks for sharing! This looks amazing! I remember how much my dad loved apple butter on his toast, I bet he would have love this, too! I need to make some. This looks so easy and delicious. I will definitely be making this and keeping and eye out for recipes using it! Wow, I love this recipe. As a peanut butter fan I love peanut butter and pumpkin butter makes me think of shifting right away. this is really a cool idea. I will try this on my own. As a apple butter lover and NC girl, you know I have to try pumpkin butter! Maybe I can use this in a dish for our annual pumpkin carving contest! I had never really thought about making pumpkin butter, this looks like something I should try. Thanks for sharing this recipe. I am a pumpkin lover....and this looks delicious. I would use this in so many places, and it is such a great seasonal dish. I would eat it all year long. This sounds absolutely delicious. I never thought to make my own pumpkin butter. It's definitely something I might try this fall! Oh my goodness, this looks wonderful! I can just imagine how good it smells ... and tastes! I'm bookmarking this so I can make it later. Do you think it would work in a recipe for dog biscuits? Yes, it should be great in making dog biscuits. Yes, it very similar to apple butter. Oh wow! I need to try this! We use butters for everything! And we love pumpkin, especially for fall!! Interesting, I have never heard of pumpkin butter before but it looks good! I have never tried pumpkin butter but have tried Einstein Bagels pumpkin cream cheese and LOVE IT! I will have to give this recipe a go. I've never made pumpkin butter. It looks so good and what a great way to make use of pumpkin or winter squash. I think I'll have to try this this fall. This would be so yummy on fresh baked bread. I love apple butter I am going to say I am sure I would love your recipe for pumpkin butter I use crock pot recipes all the time. This looks really yummy. Ive never heard of it before but Ill sure try it! Great post, thank you for sharing! I'm excited now as my sister said I can keep her pumpkin insides once we are done doing carving with my niece and nephew - going to give this a go! This looks absolutely delcious and what a perfect recipe for fall aswell! I can imagine this tasting incredible. this looks so yummy.. this is the first time to see something like this and I thin k I will try it.. I LOVE apple butter! As kids, we would use this instead of jelly for our PB&J sandwiches! I love anything I can make in a slow cooker. Plus, there's bonus points for anything pumpkin flavored. So this recipe is definitely right up my alley! Thanks for sharing. pumpkin butter... i have never heard of it before but i would love to try it. I am trying to imagine how it might taste right now and it's really got me intrigued. This sounds like a wonderful fall treat.. This is the perfect timing, we are hosting a fall BBQ since we have unusually warm weather and what better than to have at a fall BBQ than Pumpkin Butter. I can wait to try this out, I'm always looking for new things to throw together in my slow cooker. Wait, there's pumpkin spice *gum*?! haha! Oooh I've had apple butter plenty of times, but I haven't had pumpkin butter all that often! Great recipe! I can't wait to see how you are going to use this! 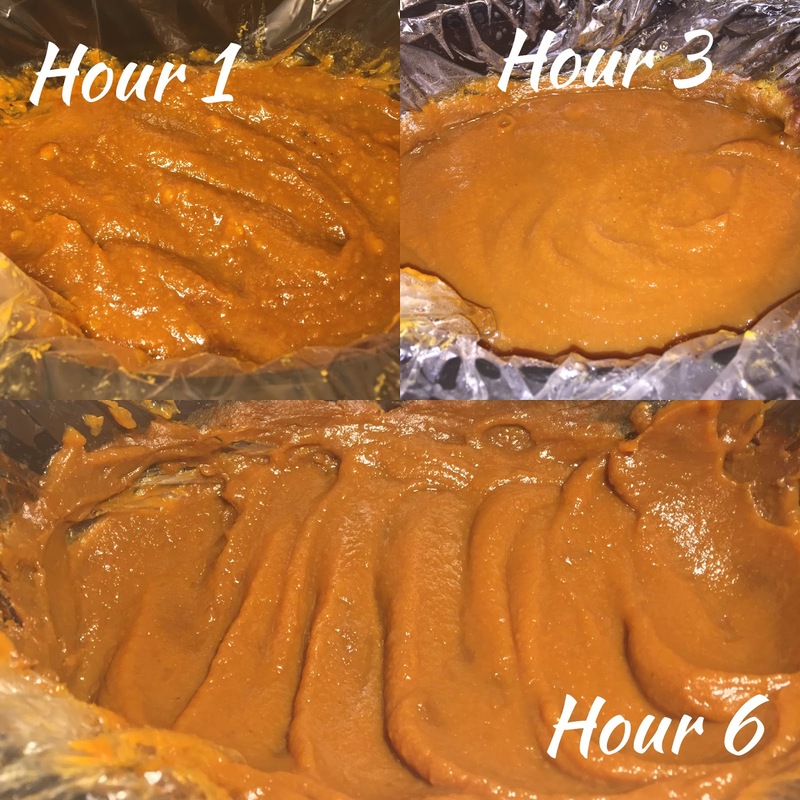 I love to use the slow cooker for *everything*, but never in my wildest dreams I would have thought about pumpkin butter! How divine does this pumpkin butter look. I can imagine having it with cake or bread. I didn't hear about pumpkin butter before but it does sound really yummy. I do have a slow cooker and I am always looking for new recipes for it. I might give this a go. I'm always looking for a yummy fall recipes! This looks amazing, can't wait to give it a try. This looks pretty delicious. I love food and baked goods that are inspired by fall. Pumpkin season is wonderful, so many delicious foods to make with it. Am loving the idea of this pumpkin butter, I imagine it would be fab for all kinds of uses. Reminds me of apple butter. Pumpkin better? Oh my, that sounds heavenly! You know what it would work with beautifully for breakfast? With a little bit of fig jam spread underneath the pumpkin butter!!! I recently made apple butter in the slow cooker. I look forward to making your pumpkin butter soon. I bet the whole house smells insanely good while this is cooking! First time I have heard of a pumpkin butter. It looks delicious. Should I be trying it? Good luck to me. Thanks for sharing the recipe. Mmm! I love pumpkin butter!!! I've never made my own though. I love that this is made in the slow cooker too. This looks great but I'm more a a sweet potato gal so I would probably use sweet potatoes instead! Can't wait to try it out! I've had apple butter and apricot butter, but never pumpkin butter.. Can't wait to see what you do with it. This Pumpkin butter looks so good. I will definitely try this recipe and I can't wait. I love the recipe! But I don't have a slow cooker, would a regular pot suit for this? Yes, you could do it in a regular pot. You would just have to watch that it doesn't burn on the bottom.